“You’re just about ready to hit your mark. The sign of Sagittarius is ruled by the planet Jupiter and is a mutable (easy going) fire sign. The ancient symbol for Sagittarius is a half-man, half-horse, known as the centaur, a creature trained in the art of archery who always manages to hit his target no matter how far he roams. Sagittarians are honest, candid and not afraid to speak the truth. Since this freedom loving fire sign is not offended by the truth, he is often surprised when others take offense to his words. Sagittarians are drawn to religious ideas even though sometimes they deny it. They will go through periods of not being religious at all and claim not to believe in anything, even bucking against authority. Religion and philosophy are concepts they remain fascinated by though – they will argue for hours about religion – and usually at some point in life they return to some type of faith, but such a faith always remains an intellectual pursuit. Sagittarians are highly idealistic, creative outdoorsy, and have a great sense of play and fun. They are also extremely restless and would prefer not to stay in the same spot. Instead they would rather roam. Sagittarians dislike routine so are encumbered by the usual nine to five job. They may end up as magicians, fire-eaters, tattoo artists, entertainers, publishers, literary agents, clergy, tutors, bookstore owners, and whatever does not require a set schedule. Sagittarians tend to be rather lucky but have a habit of not handling money well and will sometimes squander any wealth that comes to them. They are confident, which makes them highly attractive and popular, drawing to them what they need. Sagittarians also have integrity and will not go along with anything unfair or underhand. Wicca, paganism and the Catholic Church are all ruled by Sagittarius. When you think about it, these religions, with their pomp and ceremony, candles and incense, have much in common. Though not as showy as their fellow fire sign, Leo, Sagittarians tend to largesse by their nature and prefer what they do to be memorable. The archer sign does not want an ordinary life. 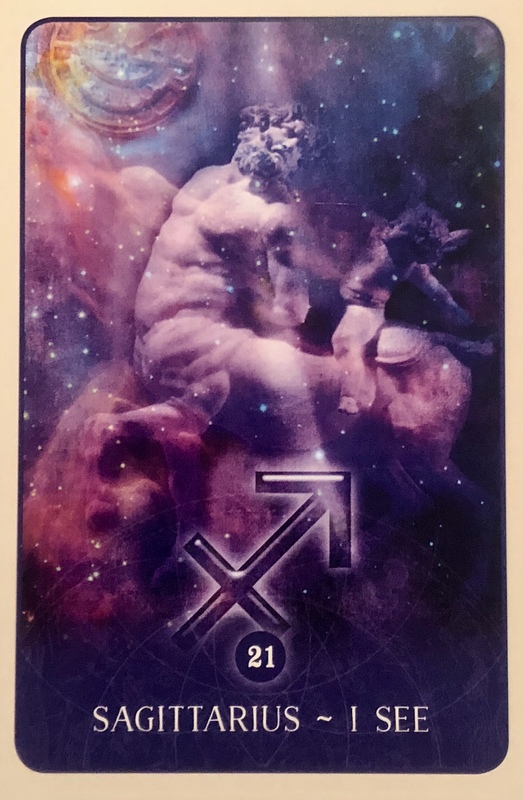 When the Satittarius card turns up in a reading, freedom at the current time is essential. You will feel the need to fight against restrictions of any kind and want everything out in the open. You want to know where you stand. If your question pertains to a relationship, you or your partner need to be given extra space and looser reigns. You may find yourself especially philosophical at the current time and even studying religions which may not have appealed to you before. Interestingly, Sagittarius is the sign representing large animals, especially horses and big dogs. You may soon be acquiring a new pet, or it may be that animals are already a big part of your life. Like these beautiful beasts, you love that sense of wildness and being in the open air. You may soon travel to areas with vast countrysides, or regions with mountains and lakes that you want to explore. You might embrace a new philosophy, enroll in classes of higher learning or begin to study churches or religions. A visit to a casino or another area where gambling takes place could likely come about. You will likely be fortunate and win in this venture as long as you don’t proceed recklessly. It’s a good time to take a gamble. We are coming to the end of Sagittarius season and things are full of the energy of adventure. How is the holiday season treating you so far? Are you enjoying the ride or are you feeling overwhelmed by it all? Maybe you can tap into some of this gregarious sign’s energy and learn to surf the wave instead of being pulled under by it! I am a Sagittarius (if you are reading this, it may just be my birthday today although I’m getting to that age where the aging part is not quite as exciting as it used to be ha ha) as are many of my female friends. We tend to see things with exuberance and optimism, and some would go as far as to say that we live in a bit of a fantasy world, well maybe that’s just me lol. I definitely choose to see things on the bright side, and I will keep my rose coloured glasses firmly in place for as long as I possibly can. Sagittarius is all about expansion, looking past the mundane and into the magic of life. It is about figuring out what makes people who they are, and what lies beyond the masks. It is about freedom and exploration and big dreams. It is about taking chances, letting loose and having things somehow work out, even in the stickiest of situations. Yes of course we have challenges to overcome and difficulties just like everyone else out there. But it’s how we face them, with the determination that everything will somehow magically fall into place and that there is a lesson within it all that if we could just learn, it would all finally make sense. With Sagittarius and Jupiter on your side for a couple more days and a full moon coming, you have a chance at some good fortune and luck coming your way. This is not mere coincidence, but an energy to be worked with. It’s your job to be receptive to what comes; open and willing to take on the challenge; strong and courageous enough to take the leap. Remember, there are only 12 days left of 2018! What will you create? Sagittarius says Go For It! You got this!